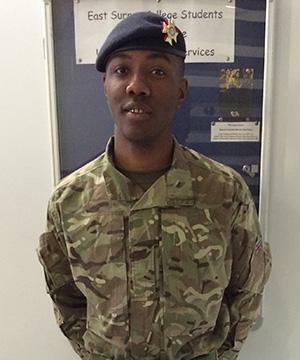 Aaron joined the Army as a recruit in February 2014 after studying Level 3 Public Services. He completed various assignments at College including Government, Citizenship, Leadership and Discipline which gave him the edge over his peers in his Phase 1 Basic Training at Winchester. Since his passing out parade, Aaron has been back into College to speak to students to give them an insight in to his Basic Training experience. Aaron will go on to his Phase 2 Training where he will be learning Military Skills and taking his Tank and Armoured vehicle driving training.